Previously, I mentioned that my band Hybrid will be performing in the Groove In Motion 2 gig this coming March 1st. Come support us and the other bands as well. If you know how to sing these songs, do join us….. I was going through some of the pictures stored on my PC and stumbled across some pics that I really liked. Some are taken by DLSR, some are taken by digicam, even some taken by phone cameras. Nevertheless, all these pics share the same significance and sentimental value. Woohoo…… it’s going down!!!! Yay! Please contact Terry @ 016-208 5678 for tickets. Come support us and see us perform. We'll be playing some Jap stuff from DEEN, Janne Da'Arc, GLAY, L'arc'en'Ciel and others.... Come support us and support other band also. I sometimes where pink-colored clothings also. However, the PINK that I'd like to mention is not about color, it's a SHE. I first heard about her when the previous JUNK lineups wanna play some of her songs. Sometime last year, one of BodyPump releases uses one of her songs for the Chest track and I fell in love with it straight away. Wanna share with you guys this song called "I'm Not Dead" taken from her I'M NOT DEAD tour DVD. Enjoy. Was tagged by Jeffrey Wong via Facebook. But I feel to share about it here as well. Once you’ve been tagged, you are supposed to write a note with 25 random things, facts, habits, or goals about you. At the end, choose 25 people to be tagged. You have to tag the person who tagged you. If I tagged you, it’s because I want to know more about you! 4. I'm a of a mixed Chinese and Thai parentage. 5. I'm chinese educated. I can read and write in Chinese. 8. People say I'm cool. 9. I can keep silent for one whole day. 10. I can listen to the one same song repeatedly for one whole week. 11. I play for 2 bands mainly, JUNK and HYBRID. 12. My room is very messy. But somehow I know where my stuff is and I can sleep easily. 13. I, along with few other band members own a band jamming studio. 14. I hate people being late without reason and notification. 15. I plan my financial budget every month. 16. I like puzzle games. Minesweeper is my favorite. 17. I'm running out of ideas completing this tag from this point onwards. Peeking at what other people wrote on their tag. 18. I like to go around eating. 20. I've traveled to Turkey alone. 21. I don't have much close friends. 22. The most expensive thing that I've bought is a 7k Musicman Axis guitar. 23. I love my family. 24. I don't own a car, I drive a bike. 25. I'm starting to hate IT job. I've no idea who to tag. 25 people is too much for me. CONSIDER YOURSELF TAGGED if you read this. See the previous result here. 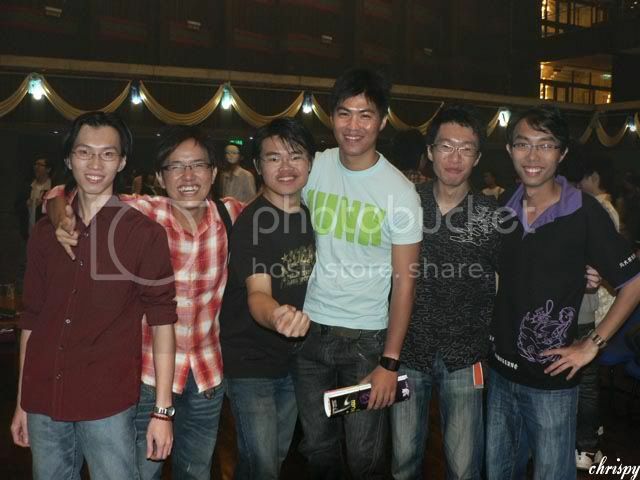 A Hong Kong chap named Yip Sai Wong who played drums for the band "Beyond". He borrowed my guitar for his show. Went to the Curve for BodyPump class today after the long CNY break.